One of the most important steps in starting a solo practice is marketing. This can also be one of the most difficult, because these lawyers depended on their previous firm for incoming business. And it’s not like they taught marketing a firm in law school. Since solo lawyers have smaller budgets than large law firms, online marketing is usually the most practical avenue. But where do we start? In this episode of New Solo, Adriana Linares interviews internet marketer Jason Marsh about the most effective marketing process for lawyers beginning a solo practice, how much they should spend on a website, and what it means to optimize your business for the search engines. Jason Marsh is the founder of Orlando-based internet marketing agency MARSH8. He frequently writes and speaks on how law firms can implement better online marketing strategies to acquire new clients. He has been working in advertising and marketing for over ten years. Adriana Linares: Hello and welcome to New Solo on Legal Talk Network. I’m Adriana Linares, I’m a legal technology trainer and consultant; I help lawyers and law firms use technology better, it’s pretty simple. Before we introduce today’s topic, I want to make sure to take a second to thank our sponsors at Solo Practice University. They’ve been a sponsor of this show for quite some time and we really appreciate you checking out their website, learning more about the classes and courses that they have to offer for attorneys out there. I want to welcome Jason Marsh from MARSH8 on the show today, hey Jason. Jason Marsh: Hi, how are you doing? Adriana Linares: I’m doing good! We’re excited to have you on because you’re the first – you’re the anchor, no pressure – in our little series of episodes we’re going to do specifically about marketing, so you should be honored. Jason Marsh: I am honored, thank you so much for having me as your first. Adriana Linares: I know, in many ways, I’m sure. So as my first guest on our marketing series, tell us a little bit about yourself. What qualifies you as a marketer? Jason Marsh: Well my main focus is internet marketing. I’ve been in the marketing industry for a long time. I started working and advertising in New York City about a decade ago and I worked as a copywriter for a while and then I somehow got involved in the graphic, more visual elements of things. And in 2008, I started my own firm and at this point the firm focuses primarily on digital marketing. We work with a lot of law firms, a lot of small businesses as well. But I like to tell people we’ve worked with everyone from Silicon Valley, back technology companies, to broadway shows and everything in between. Adriana Linares: That’s great. And so you do some work with lawyers in law firms, that’s one of the reasons I asked you to come on this show because i know that you have a lot of experience just getting into and through the basics for lawyers. So let’s do this, let’s do a little roleplaying. Let’s pretend that Adriana Linares, your favorite legal technology trainer and consultant, has recommended a client of hers to you. And all I said to the client was, “Call Jason Marsh at MARSH8, he can help you, you don’t have anything going so far for marketing.” So client calls you up, I’m the client now. Are you ready? Adriana Linares: Hey Jason, my name is Bob and I got your name from Adriana LInares and I’m interested in doing some marketing for my band new law firm. Jason Marsh: Hey Bob. Well, the first thing we’re going to do is we’re going to find your niche, we’re going to figure out how to brand you. And one of the first things that attracts me is you have a very high voice, so I think there is something that we can do, Bob. But really, when it comes to marketing, really the very very first thing you want to think about is what is your focus going to be and who is your target audience. So especially if you’re a lawyer that’s just starting out with a solo and small practice, you really want to think about what your niche is. Jason Marsh: So I go with “nish” because some people say “nitch,” and some people say “neesh,” so I just go with “nish” and split the difference. But really it’s all about trying to figure out specifically what segment in the market that you want to target, and that’s not just by practice area. So say you want to go out as a criminal attorney. I think if you’re new to your own firm in the legal industry, even focusing on criminal law is still going to be way too wide. Because you have to remember that there are lawyers who have been focusing on criminal law and marketing themselves and spending money on branding themselves for five years, ten years and beyond. So you really are probably going to be in a very competitive market. So what I would suggest is really narrowing that focus even more. So if you want to focus on being a criminal lawyer, I would ask you if there is a segment within criminal law that you could focus on. Maybe that’s juvenile defense in criminal law. And then I would say that there’s probably a lot of lawyers who do that as well, but is there a way to focus that even further so that you could really become the specialist in a specific area. So maybe you’re going to be a criminal defense lawyer that does juvenile defense but focuses on juveniles that maybe have gotten charged with some sort of drug issue. Jason Marsh: So now you’ve really started to drill down and focus and that’s where you can really muscle in on the people that have been in that space for a while and find your space and start to brand yourself. Then you can go one step beyond that as you can focus on certain affluent areas so that you’re targeting parents that have the ability to spend a lot of money on a criminal defense lawyer to get their children out of trouble. So the first thing to be would to have those discussions and just try to find some area of focus that you can really dive into and become the expert on. Adriana Linares: Okay. So let’s say that’s where we start. I’m Bob again, and I say, “Okay, that sounds good, we’ve determined what my niche is going to be. So do I need a website, do I need a blog? How about a podcast? Should I do TV commercials? Do I need a Twitter handle? How about Facebook? Is Pinterest a place I should look at? What should I do with Google Plus? Jason Marsh: So all of those things, but the main thing to consider is that you want to prioritize those. So sure, you want to do a podcast, you want to have TV commercials, you want all of those things. But there’s a certain priority that you’re going to want to focus on in terms of rolling those out. Because we’re going to make the assumption that you don’t have an unlimited budget and that the things that you do spend money need to generate a return on that investment so that you can put those profits back into new things. So a good starting point – and of course I’m an internet marketer, specifically, so I tend to view the world of marketing as to how you can acquire new business and clients online. So obviously a website’s going to be a very good starting point. Adriana Linares: Okay, Bob is very cost-conscience because she’s new. Jason Marsh: Oh, Bob is a she now, transitioned. Adriana Linares: Well, with my high-pitched voice, I might as well just go for it. So Bob is new and she has a very limited budget. I want to know exactly how much a website is going to cost me. Jason Marsh: Yeah, that’s a question that always comes up very early on and the answer that people love to hear is it depends. But I would say when it comes to spending money on a website, there’s a number of different avenues and I would say for lawyers that are starting out, spend as much as you can afford to get as high quality of a website as you can afford. And I would say to do that, you can probably get something pretty darn good within the $1500 range. And what you’re going to get within that range is something that’s probably more of an existing website template, you’re not going to get a lot of custom design. Adriana Linares: So it’s like a WordPress template. Everybody talks about WordPress and all my other solo friends that have gone out on their own have said “Well, I just pulled up WordPress and threw something together and then there’s this WordPress thing.” So do I want to build my own WordPress website? Or is it better to hire somebody to help me and spend a little extra money? Jason Marsh: Well first off, WordPress is a platform, it’s known as a content management system and it’s what the website is built on so that someone without technical expertise can log in to the website and make at least some basic updates to content and images and so on. So I would say first and foremost, yes. You want to be thinking of your website, what content management system or platform you want to build it on. WordPress is a really good one that I generally recommend. It’s the one that I’m most familiar with and I think is most ubiquitous. And the importance there is you’re going to be able to readily find people who can help you with WordPress. Should you do it yourself? Sure. If you have the ability to install WordPress and you know your way around that a little bit, I would say definitely. If it’s something that you’re going to have to spend a lot of time learning, I’d say you’re better off spending your time on other areas of growing your practice and pay a little bit of money just to get it done. Because the area that you’re going to now have to focus on is developing the content for that site. Adriana Linares: Well I can say – as Adriana, not as Bob – that everybody thinks WordPress is so easy that me, myself, as a technology junky and as someone who likes to do everything herself, I had a hard time with WordPress. And it was easy to get the basics but as soon as I wanted to put anything special outside of whatever the template was that I ended up messing around with, it was hard. So I like your advice of finding somebody to help you. Now let me back up just a minute because you said something about a high quality website. What makes up a high quality website? Again, I’m coming to you, hey, I’m Bob. All my friends keep telling me I need a high quality website. What are the two or three things that make up a high quality website? Jason Marsh: Yeah, so think about it in a sense that when your prospective clients – again let’s go back and think about the people that you want to target. When they arrive at that website, are they going to be impressed with what they see, in terms of visually, the way it looks. So again, you don’t have to spend a fortune but you want to select a template that just looks good, and if you hire someone, they should be able to help you navigate that. The second potentially more important thing is the information and the content that you have on the site. So you’re going to want to make sure you have some good photographs of yourself, your office, anyone that may be working in the firm. Adriana Linares: Do I need to hire a photographer or can I use my iPhone? Jason Marsh: So I would say before you do anything, you can use your iPhone, sure, or someone else can. But what I would recommend is go hire a photographer. Go hire a photographer for one hour, have them come to your office, take some headshots of you, take some different shots of you around the office, sitting at your desk, maybe outside, maybe in a conference room if you have it. If there’s any people in the office, take some photos of them. Also get some photos around the office, but all you’re trying to do is just build up a file so that when you are building your website, your website developer or the person you’re working with is going to say “Okay, I need some content.” So you’re not looking at that email, starting to scramble looking over at your iPhone digging in selfies and things you might do, but you already have some stuff in the bag that you can start to send over. So that’s the visual content. The other part of that is the informational content and that’s going to cover the areas that you practice, your background as a lawyer, and maybe some personal items about how you treat your clients and that’s what you’re going to need in the basic sense to start with. But all of that and how well you present that information is going to be important in terms of how people receive you when they’re viewing you online. Because keep in mind, that website is open 24 hours a day, 7 days a week, and people can be looking at that website drawing opinions without you even knowing they’re there. Adriana Linares: What about this malarky I keep hearing time and time again that content is key? Is that still true? Jason Marsh: Well content has always been important and it’s going to continue to be important. Adriana Linares: And what do we mean by content, can you explain a little bit? When you say to your clients that come in and say “What do you need from me?” And you say, “I need content.” You’re going to say alright, I need some good pictures of your environment, and then what? Jason Marsh: Well content can mean a number of things, it’s obviously going to start with the written word, but it’s photographs, diagrams, charts, reports, guides, any number of things that’s informational. Adriana Linares: My wedding videos? Jason Marsh: Sure, then that would be something that you would want to include. But if you’re a juvenile defense attorney, you’re going to want a lot of information about what types of issues juveniles might run into. If your focus is drug charges, you might want to talk about the range of drug charges that a juvenile may face, the type of outcomes that are possible, and also you could put case studies, different things. But all of that forms the foundation of content, and that’s very, very important because the content’s going to form the foundation of most of the marketing you do going forward. Adriana Linares: Alright, so before we move onto our next segment, we’re going to just stop here to take a quick break, because when we come back, I’m going to say, “Okay, so now I’ve got content, I’ve got a WordPress slider, I’ve got a website, so now what are we going to do with it all? Are you going to help me with my SEO? And of course, as Bob, I don’t necessarily know what that means. But before we move onto our next segment, we’re going to take a quick break to hear a message from our sponsors. Adriana Linares: Welcome back to New Solo, I’m Adriana Linares and with me today is Jason Marsh of MARSH8. Jason is a digital marketing specialist and he’s been helping us understand the foundations of internet marketing and digital marketing. So in the last segment we started talking about the types of things that we need on our website, how do get started with a website, find someone like Jason and get maybe a WordPress site or some sort of site down. We’ve got some office pictures, we’ve got some content that we’ve been talking about, and then of course the ultimate thing that everybody hears about when it comes to being found on the internet is those three little letters, SEO. What does that mean, Jason, and how can I get some? Adriana Linares: So what do you mean when you say that? Jason Marsh: What’s that, SEO? Adriana Linares: They’ve been in the space already. The interwebs? Jason Marsh: Well, they’ve just been in the industry and they’ve probably been doing a lot of marketing, including online marketing, including SEO for many years. So they’re way ahead of the game. Adriana Linares: Yeah, how do I get there? I’m starting from scratch here and these guys have been running around for ten or fifteen years working up all sorts of traction in that world, so what do I do? Jason Marsh: Well that’s exactly what’s happened. As any area of law that tends to be profitable, there tends to be a lot of lawyers that have been investing in their internet marketing, in their SEO, in their presence, and all of that. And so yeah, you’ve now got to catch up and it’s doable if it’s done right. But I think it starts with identifying a unique niche, because if we go back to the criminal lawyer niche, if say you’re in Orlando which is where I’m based, that’s an extremely competitive area, and there’s a lot of lawyers that have been focused and have really good ranking. And you’re not just going to come out and just build a website and put up a few pages of content and have an expectation that you’re all of a sudden going to start generating a lot of traffic and phone calls and start generating thousands and thousands of dollars of revenue. So what you’ve got to do is you’ve got to go back and identify that niche that we talked about and say what’s a really focused area of criminal defense law that no one else is focusing on. Adriana Linares: Or at least not out loud. Jason Marsh: Or at least not out loud. But this isn’t just a strategy that works with SEO, this is a strategy that works in business. There’s big companies out there that cover large amounts of real estate. But the way the smaller companies come in is they target really focused areas and service really specialized areas of need, at least to start. And then you can go wider from there. So my recommendation from an SEO standpoint – and this is also going to work on the paid side as well – is you focus on that niche and you develop content. So let’s talk about what we mean by content. So when you think about your targeted audience, think about the questions that they have and the things that they might go online looking for information and answers about and answer that. And write as much of that is you can, and if you can’t write it find someone who can. Because it’s that content that’s going to grow and start to form the foundation of your SEO strategy. It’s going to form the foundation of your advertising strategies in many ways and so you want to start to build that out overtime. Adriana Linares: Like an FAQ? Jason Marsh: An FAQ is a place to start, comments you can identify, maybe talk about cases that are in the news that might be applicable to what your clients might be concerned about. But just talk about all the finer points of the law and the different things, because that’s going to help you get indexed in Google for all the specialized things. So I guess if we step back, the bigger picture here is if you’re a criminal lawyer you’re going to have a very difficult time ranking organically for criminal lawyer Orlando, but you have a much better shot focusing on juvenile lawyer, juvenile defense criminal lawyer Orlando. Adriana Linares: So my question for you then is how fast does that happen? Can I expect to see some results by next month? Adriana Linares: Can you explain that a little bit more? What does organic exactly mean? Adriana Linares: Okay, so just the natural strategy content, links in links out? Does that count anymore? Jason Marsh: Sure, so that’s another important factor when it comes to SEO. When we talk about SEO and how Google ranks specific websites based on specific keyword queries or topics, relevancy is going to be a very important thing. But you also have to realize offset sites are probably going to be relevant, so now Google’s algorithm has to rank those sites that are relevant to this keyword query. How do they do it? How do they determine who’s got more authority, what website is more valuable? Well one of the factors that we know is very important is links. And those are links pointing to your website. Those are considered, let’s say, votes for your website. One time, link building was a term you might have heard a lot if you were working in SEO or undertaking some side of SEO campaign, which really just boiled down as many sites, any type of links, linking, pointing to your site. Well that doesn’t work anymore, link building is for the most part dead. Now what we talk about is link earning. So really, you’re looking for editorial links. You’re looking for links from quality websites and resources. So it’s not the sheer number of it. So in some ways, SEO’s gotten easier if you know how to do it, because the sheer volume is down but the quality has gotten much higher. So what you’re trying to do is you’re trying to find industry blogs that cover it and this is another reason why focusing on that specific niche makes you more enticing as a lawyer, as a website, and more able to get a link to your website. So earning links to your website is something that is definitely important and is going to be an important factor in how high you can rank for particular search queries. Adriana Linares: Well, it sounds – and I, of course read a lot about this and intend to keep an eye on it too. It seems like it’s just becoming harder and harder to cheat the system, and that’s one of the things that I make sure that we say out loud to lawyers is don’t fall prey to marketers who say we’ll get you on the first page of Google search. You have to pay attention to exactly what that means. Are you going to end up in a directory? Are you going to be on the front at the first page on the top of the hit list? But you’re also buried inside of another legal directory. There’s just no easy way to do it this way. It’s almost as if SEO and internet marketing has become quite honest because all of the ways that Google is rewriting and building these algorithms all the time. Am I on the right track? There’s no magic bullet, right? Jason Marsh: There isn’t, and one time there may have been some magic bullets and the types of businesses that followed those things quite honestly are now in all sorts of penalties and are in trouble with Google and that represents quite a lot of work now as fixing problems like that for people. But Google’s algorithms has gotten a lot more sophisticated in the last few years, so the most important thing that Google is trying to do is identify the highest quality websites that exists for a specific search query. And the reason they’re doing that is because every time you went to Google and you got a bunch of lousy results, you’d probably stop using Google. So it’s very important to them that they’re ranking high-quality sites. So just having a lot of pages with 100 words, 200 words, that doesn’t work anymore. There’s different types of penalties that exists for thin and low-quality content as well as really spammy, backlink profiles where people just went out and procured links from a whole bunch of different places. Adriana Linares: Right, and I know that you spent a lot of time sometimes fixing those websites and have a lot of experience in and I know you get very frustrated when you have to sort of reverse-engineer some of that bad SEO work that people have done in the past. Before I let you go – because we’re almost out of time – I do want to make sure we tie up the circle of organic versus paid. So you explained to us what organic is, and so then what my question is when you’re putting together a marketing package for clients, do you include paid advertisements and banners and that sort of stuff as an effective way of doing internet marketing? Jason Marsh: We do and we generally look at multi-faceted ways to promote the firm. And so as I described earlier, there’s two buckets, there’s your organic and there’s your paid advertising side. The organic is something that’s more of a long term approach as you’re doing all the things that you talk about, trying to improve your organic ranking in Google, you don’t have to pay for that organic ranking, whereas on the paid side, that’s something that can happen much more quickly as in terms of getting your site visibility and promoting it. But you’re paying, it’s traditional advertising. Adriana Linares: How much am I paying? Jason Marsh: How much you want to pay, and that’s really what it comes down to. Adriana Linares: I have $250 a month that I can budget toward paid advertisement on the internet. Would you bocket that or would you say hey, that will get us started. Jason Marsh: I would say that’s generally a small budget but not that you can’t start with that. And again, this is going to go back to being niche, because if you’re targeting criminal defense lawyer Orlando, that’s probably going to cost you $30+ a click or more, so you can do the math and see how many clicks you get there. But I can guarantee you if you’re focusing on some very specific area of criminal law like juvenile defense for drug charges or something like that, then the clicks are all of a sudden probably $5 or $10, and now all of a sudden your budget is a lot cheaper. So anyway, you definitely have to think about when you’re thinkin about organic as a long term approach. Paid is immediate traffic, immediate feedback in terms of what people are responding to from an advertising standpoint. Adriana Linares: Well, sounds like we have a lot to learn, so I’m glad that we’re doing this in a series because unfortunately, we’ve run out of time, which always drives me crazy when we’re talking about such interesting and useful topics. So before I let you go, I just want to make sure and ask you how our listeners can either get ahold of you or keep an eye on what you’re doing out there on the good old pipes. Jason Marsh: Yeah, sure, you can follow me on Twitter, @_JasonMarsh, you can also email me at [email protected]. I’m always happy to talk to people and answer any questions and lastly, you can subscribe to my mailing list where you’ll get lots of cool tips, content, and resources like webinars, podcasts and videos with lots of ideas and great information to help grow your practice and leverage the internet. And there you can just get that at MARSH8.com/subscribe and sign up for that. Adriana Linares: Well thanks so much, Jason, I really appreciate your time today. Jason Marsh: Yeah, thank you for having me today. 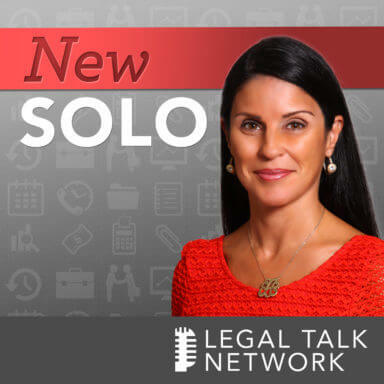 Adriana Linares: For all you listeners who’d like more information about what you’ve heard today, make sure to visit New Solo at LegalTalkNetwork.com. Don’t forget, you can find us on iTunes, you can subscribe via RSS, of course we’re on Twitter and Facebook. So that brings us to the end of our show. I’m Adriana Linares and thank you so much for listening. Join us next time for another great episode and remember: you’re not alone, you’re a new solo.